The musical roots of the magnificent Gulangyu Island are so deeply entrenched that even its name literally means “the islet of drumming waves”. Supposedly the sound of the ocean waves hitting the reefs sounds like the thundering of mighty drums, so Gulangyu is an island permanently permeated by natural music. The island is located just southwest of Xiamen City and is sometimes colloquially referred to as “Piano Island” because, on such a small island with a population of just 20,000 people, there are a staggering 5,000 pianos and even a Piano Museum! To put that into perspective, that’s one piano for every four people. This unusual pastime, along with the bizarre colonial architecture and curious number of Christian churches, can only be explained by Gulangyu’s history. After the First Opium War (1839–1842), China agreed to a pact known as the Treaty of Nanking with Great Britain, France, Japan, and 10 other countries. In this arrangement, Xiamen was named as one of the five seaports opened up to foreign trade. In 1903, Gulangyu Island was designated as an international foreign settlement, which allowed members of the 13 partner countries to settle, build houses, start their own businesses, and control the administration of the island. During this time many colonial-style mansions, churches, and hospitals were established throughout the island and are some of the only buildings of their kind throughout China. Along with the unusual style of architecture, newcomers to the island also brought with them their love of Western instruments and many of their competitive sports. After all, if the islanders won’t go to the piano, the piano must go to them! Nowadays the island is almost completely pedestrianized, as no vehicles are allowed except small electric buggies and a handful of fire engines. From designer furniture to bushels of fruit, all produce on the island is moved by handcart. The only way to access the island is via ferry, which can be caught from a number of ports in Xiamen. Just don’t try to skip the fare and swim across instead! Sunlight Rock represents the island’s highest point and can be found in the south-central part of Gulangyu. With an altitude of just under 93 metres (304 ft.), it’s hardly vying for the top spot among China’s other mountains but does look particularly beautiful bathed in the soft light of the sunrise. The Memorial Hall of Zheng Chenggong, also known as Koxinga, was built at the foot of the hill in honour of this war hero, who drove the Dutch colonists out of Taiwan in the 17th century. The Dutch regard him more as a marauding pirate but, after all, history is written by the victors! As you scale this tiny peak, you’ll find poignant inscriptions engraved into the rock by poets, some of which date back over 400 years. 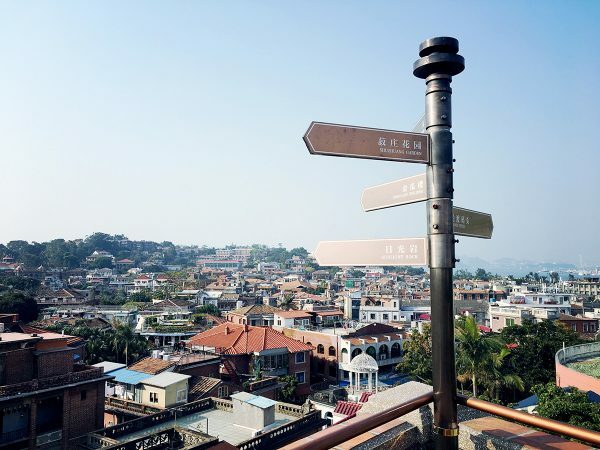 At the summit, a breath-taking panorama of Xiamen City can be seen. 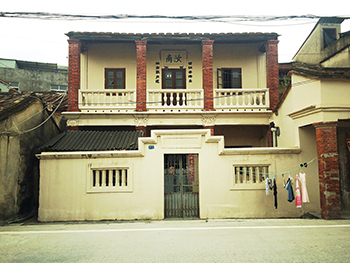 Many of the other attractions on the island were once simply residential houses, including Shuzhuang Garden, which was built in 1931 by a wealthy Taiwanese businessman named Lin Erjia, or Shu Zhuang to his friends. The garden was opened to the public in 1955 and serves as a perfect example of the three most important characteristics of Chinese gardening; hiding elements, borrowing from one’s surroundings, and different types of movement. An example of a hidden element is the way in which the ocean remains covered even if you walk right up to the garden’s gate. Once you finally emerge from the bamboo forest, the stunning seascape is considered your reward. The term “borrowing from one’s surroundings” refers to the clever use of natural scenery in the garden, such as coral reefs and slopes that were organically formed before the garden was built. Yet, like your wayward neighbour, they’ve “borrowed” these elements for so long that it’s likely they’ll never give them back! Finally the interplay of connected caves and forests, intermingled with pavilions, encourages the different types of movement, from elders resting on benches to children rushing through the trees. Within the garden, the island’s renowned Piano Museum can be found. The museum houses more than 100 beautiful pianos of all shapes and sizes that were donated by a Gulangyu local named Hou Youyi, who went on to study music at the Royal Conservatory of Brussels before eventually settling in Australia. Among them, you’ll find a street musician’s barrel piano from France and a stunning grand piano crafted in 1801 by composer Muzio Clementi. Other highlights of the garden include the Forty-Four Bridge and a hidden cluster of sculptures designed after the 12 animals of the Chinese zodiac. For the music aficionado, a complementary Organ Museum can be found on the northwest part of the island. Just don’t go in there expecting a new heart! Alongside Shuzhuang Garden, the Haoyue or “Bright Moon” Garden is another local favourite located in the southeast of the island. The garden contains two magnificent statues of the national hero Zheng Chenggong, as it is believed he stationed his troops in this part of the island. The bronze statue is nearly 5 metres (16 ft.) in height while the granite statue, which guards Dingfu Rock on the eastern seashore, is a staggering 16 metres (53 ft.) in height. To put that into perspective, that’s about five times the size of an African elephant!